Porsche, one of the greatest sportscar makers in automotive history has set a new Guinness World Record. However, it’s got nothing to do with speed or lap times. Instead, a standard specification Porsche Cayenne SUV has just broken the official record for the heaviest aircraft ever towed by a production car. The aircraft in question was an Air France Airbus A380, which tips the scales at 285 tonnes, and the plane was towed 42 meters at Charles de Gaulle Airport in Paris, under the watchful eye of Guinness adjudicator, Pravin Patel. In recent years, Jaguar Land Rover has developed a reputation for setting Guinness World Records as a means of highlighting its cars’ capabilities. The Jaguar XF holds the record for the car-based tightrope walking, and the F-Pace performed the world’s largest-ever loop-the-loop (19.08 meters) when it was unveiled at Frankfurt. The Land Rover Discovery drove across the biggest ever structure built entirely from Lego — a 5 million+ brick replica of London’s Tower Bridge. The Range Rover became the first SUV ever to drive over a bridge built solely from paper when it came to the Guangzhou motor show in November 2015; and in June the Land Rover Discovery Sport towed a 100-tonne train for 10km along a Swiss railway line. 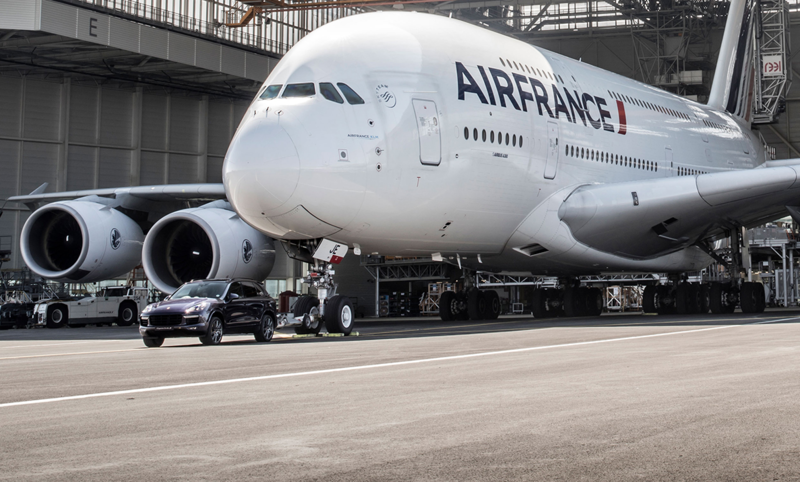 However, an A380 weighs 185 tonnes more than a Swiss three-carriage train and, crucially, 115 tonnes more than the heaviest aircraft towed by a car to date. “I’ve verified some amazing record attempts during my time as a Guinness World Records adjudicator — watching a Porsche Cayenne tow one of the largest aircraft in the world definitely ranks as among the most spectacular,” said Pravin Patel. When it comes to setting records for weight towed, car companies plump for a diesel due to the greater levels of torque the engine offers, and Porsche is no different, setting the new benchmark with the Cayenne S Diesel. However, it then de-coupled the car from the plane and did the tow again, this time with the gasoline-powered Cayenne Turbo S.